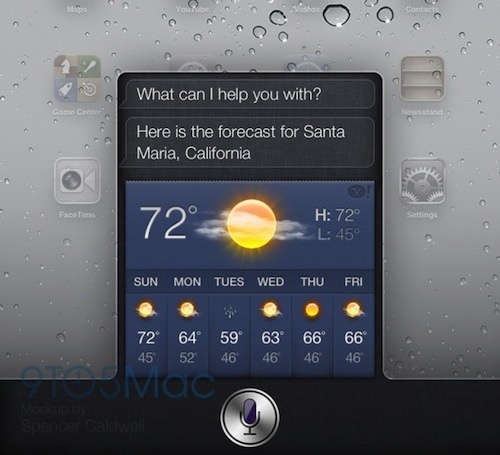 9to5Mac reports that one of the major new features coming in iOS 6 is the addition of Siri to the iPad. Siri is currently supported only on the iPhone 4S, with the new iPad having gained the dictation aspect of Apple and Nuance's voice recognition partnership but not seeing the inclusion of full Siri support at its launch earlier this year. The report speculates that Siri for iPad may be exclusive to the new third-generation models, and it is unclear whether Apple will tout the feature at next week's Worldwide Developers Conference or if it will elect to keep it under wraps until closer to the public launch of the software later this year. "Siri, how good is the microphone on the iPad?" "I found these music stores near you whose reviews mention microphones." "Oh, guess that still answers my question." Let's hope that Apple also allows ipad2 users to enjoy Siri as well. It's not like the iPad 3 has a better microphone or processor anyway. I hope this doesn't happen with current devices. Siri is the one exclusive thing we have to show people we own iPhone 4S and not one of the older models. Siri on the next iPad makes sense since we'll have other distinguishing features. Oh sorry, I didn't know that you needed something to show off. Yay! That will be a welcomed feature for my iPad. But it sill begs the question, why didn't they include it with the iPad at it's launch and only had dictation?